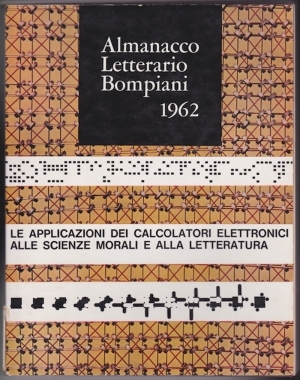 In May 1962, few months after the publication of Almanacco Letterario Bompiani, the Olivetti showroom in Galleria Vittorio Emanuele in Milan hosted the exhibition Arte programmata. Arte cinetica. Opere moltiplicate. Opera aperta (“Programmed art. Kinetic art. Multiplied works. Open works”), organized by Bruno Munari and Giorgio Soavi. The works by Munari, Enzo Mari, Gruppo T and Gruppo N are featured. The text of the catalog is by Umberto Eco. This exhibition makes a very unique and probably unmatched situation come true: a large company, which is contributing to the innovation of society and culture, produces an exhibition of artworks by artists who are dealing with the same issues in society and culture. Olivetti promoted the exhibition in other venues in Italy, in Venice and Rome, where Getulio Alviani and the artists of GRAV (Groupe de Recherche d’Art Visuel) were featured, as well as abroad, in Düsseldorf, London, and in collaboration with the Smithsonian Institution in the United States, with the supervision of Munari. In the catalog Umberto Eco writes: “It is not true that forms approved by tradition are the best because they reflect the stability of natural cycles. The stability of the solar system is valid as a point of reference for a man who is standstill on the planet while the planet moves. But what of a man who moves like the planet in the opposite direction, at a faster speed? All his modes of thinking, of perceiving, of reflexive functioning would change. And it would be much better if the geometrists of form, the planners of iron dust, the architects of re-embodied spheres, the lyricists of little electric toys that move colored ribbons, net surfaces, lights plate glass, tassels and cylinders had accustomed him to consider that forms are not something immobile that awaits to be seen, but also something ‘becoming’ while we watch it. Arte programmata. Video from Archivio storico Olivetti.